MSNBC host Joe Scarborough Thursday morning put his finger squarely on the most astonishing and dismaying thing about this president, which is that he is fully vested in the prosaic, anti-intellectual liberal trope that conservative thinking isn’t actually thinking at all. It’s what every conservative has experienced at one time or another with your random liberal: that other viewpoints simply are not to be tolerated and are informed either by stupidity or malice. Barack Obama says, if we are to change the way that John Boener and Mitch McConnel think . . . change the way they think? Is he really the sole arbiter of what is right and just? Is he the only one who cares about the poor? President Obama doesn’t know much about friction. He knows better about proclamations and executive orders. 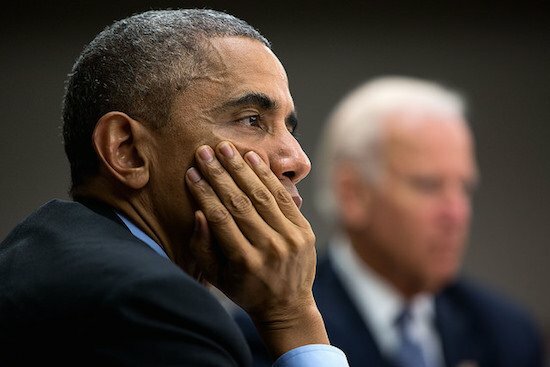 At least Obama shifted the conversation from race to “class,” saying, “what used to be racial segregation now mirrors itself in class segregation and this great sorting that’s taking place.” I give him credit for backing off the unhealthy over-focus on race that he’s been conducting as of late. And while I don’t agree that class bias is the central problem for the poor, I accept that he thinks this and understand he has a reasonable argument to make. And I believe, as an irretrievably unreformable optimist, that I might be able to present arguments that would alter his views, even if just a bit. But I don’t believe that more-accurate reporting will change what he thinks. That there is some sacred text of infallible thinking that would make him tearfully embrace my vision of the truth. It’s profoundly discomfiting to have a leader of a country with such a dismal, uninformed view of the philosophy held by his opponents and tens of millions of people around this nation. In fact, 38 percent of Americans consider themselves conservative, compared to 34 percent who say they are moderate and just 24 percent who are liberal, according to Gallup. Maybe Obama needs to watch a little less sports and read some John Locke, some Friedrich Von Hayek, or some Milton Friedman. Imagine how relaxing that would be on a Saturday afternoon instead of golf? Gee, Frowny Face, you don’t watch Fox–I watch your show…what gives? Obama is always the smartest one in any room. Mostly, because he will not enter a room unless it is filled with east coast, limousine-liberal trust-funders, junior staffers, or college kids. We rise to the level of those whom we surround ourselves with. He is truly the epitome of Liberal… I am smart, so I am right. You are not smart, hence, you are wrong. ding ding ding, class dismissed. This so called president is the epitome of arrogance. When the good Lord was handing out brains, Nobama thought he said trains, and missed his. jawboner-in-chief is an insufferable bore. If you don’t believe it, just ask Osman Yahyas, the sixth grader who ‘interviewed’ him last week. I bet he will think twice before he shows up in an elementary school again! That kid nailed it ! Shut-up, you already said that. This pathetic president speaks like an indoctrinated college graduate who has zero experience in the real world, and since this president has zero actual experience in the real world, it’s like he graduated from college, lived in mommy’s basement for 30 years, and then miraculously emerged as leader of the free world. Every time this pseudo-president opens his stupid mouth I cringe with embarrassment. Yet lacking even a sliver of self awareness he continues, year after year, mouthing banalities and long discredited left wing tripe, and this silly silly man has not a clue how silly he sounds. An imbecilic clown as ignorant as a sheltered student taught by eternally adolescent Marxist professors. He is the same age as I. It doesn’t seem that he paid any attention back in the 60’s and 70’s. Maybe his TV was broken the entire time. Maybe his family did not discuss politcs as mine did. I do not think he paid attention to the entire Country working though that time. It seems he missed out and wants to start all up again, so he can be a part of it. Good point! He’s like a broken record player from the 60s stuck on track one. I would have loved to see o sitting at the table with my Dad, grandfather, a couple of great aunts and uncles, and/or aunts or uncles. They use to discuss politics when I was young. O would not have been able to keep up with the conversation, and when someone disagreed with him, he would not have been able to sit proud, and defend his thoughts. I would have been impressed had Mika made those comments – from Joe, I feel kinda “meh”. Don’t forget–this is MSNBC and they actually often attack the dems. The crux is that Obama thinks there is no room for discussion unless all parties are on his side. Not how it works–anyplace on earth. You must watch a different Morning Joe than I get in New York. Mika, because she’s most definitely in Eliz Warren’s camp, does diss Hillary but I hear more R bashing from Joe than I hear Dem bashing by others. I think so–try it. Joe was supporting Rubio–not formal support, but saying pos things the other day and Mika was rolling her eyes–I was afraid they would tumble out! She was trying to get Howie to roll with her…Yes, she’s for the would-be Indian and is very clear on that. I am trying to remember when Joe dissed Reps–he more or less defended Jeb’s gaffe. They are kind of so-so on Cruz, as I recall. They have said Paul tries at least to reach unlikely groups like Latinos and blacks. Don’t remember much said on Huckabee. Wow–you are testing my memory here. I watch maybe an hr a day–it repeats, as you know, thru the 3 hrs. I watch MoJo like you do, the first half hour; then I flip between the Three Stooges that is CNN and the Dog and Pony show that is Fox until 7 and watch a half hour of Norah Finger Pointing CBS This Morning. By then I’m banging my head on the countertops. We’re not too far from the standard of the Soviet Union: Party opinion is rational; you disagree; therefore, you are irrational and must be put away until you become rational, however long that takes. Seven years too late. And Icky sits there with her fine nostrils pinched with dismay. 70 million plus on Medicaid, 40 million plus on food stamps, over $65 billion in federal EIC payouts, plus a few other programs. Do not forget OASDI. Most have little idea how large State assistance has grown. Socialists would have us all be ‘leeches’. In a way I don’t care what Obama says nor am I shocked by his new level of candidness. I have been distrustful of him since he announced he would “fundementally change the United States”. How could anyone vote for a man who said they wish to change the core, the essence of the greatest country in the history of the world? I am concerned about the intelligence and political orientation, if such a thing even exist any more now replaced by an “American Idol” mentality, of a electorate that put an inexperience, little known person like Obama into the White House. Obama is not the disease, but rather a symptom of it.